The Cougars snapped a five-game losing streak and won on the road for the first time this season. 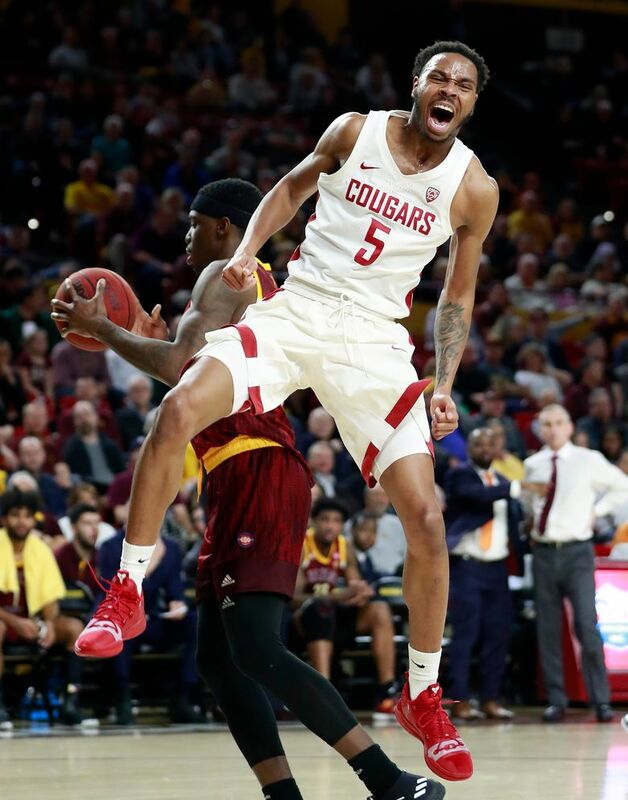 TEMPE, Ariz. — Washington State has had little to celebrate this season, so a surprise victory in the desert felt awfully good. “This is a big, big win for our program,” Washington State coach Ernie Kent said. “There really wasn’t anything overly positive that you can say. It was a pretty damaging loss for us,” ASU coach Bobby Hurley said. Franks, who scored 34 last season against California, made 11 of 16 shots, 5 of 8 three-pointers and grabbed 13 rebounds. Franks said it was “most definitely” the Cougars’ biggest win of the season. “The way that we ran, we defended and shared the ball is something that we’ve got to predicate the rest of our season on,” he said. The big difference came from long range. The Cougars made 12 of 29 threes, while the Sun Devils were a dismal 3 of 28. The Cougars, whose only other conference win was at home against California, took a double-digit lead early and never were seriously threatened as Arizona State added this loss to other pratfalls against Utah, Prince­ton and Stanford by a Sun Devils team that expected to contend in the Pac-12. Kent said the Cougars have shown glimpses of excellence. PULLMAN — Kianna Ibis scored 22 points and No. 20 Arizona State took over in the second half to defeat Washington State 61-46. Robbi Ryan added 13 points for the Sun Devils (16-6, 7-4 Pac-12), who trailed 28-27 at halftime before rolling to their third-straight win. Oscar da Silva tied a career-high with 23 points and had nine rebounds and seven assists as Stanford handled Oregon State 83-60. Josh Sharma added 20 points and eight rebounds and Daejon Davis from Garfield High School had 11 points with three three-pointers for the Cardinal (12-10, 5-5 Pac-12), which has won four of five. Tres Tinkle scored 16 points and Stephen Thompson Jr. added 15 points for the Beavers (14-8, 6-4). Harald Frey scored eight of his 22 points during a 10-2 run in the final two minutes to help Montana State beat Eastern Washington 74-66. Jesse Hunt’s layup gave Eastern Washington a 66-64 lead with 2:35 to play. Frey answered with a three-pointer, a jumper and three free throws and the Bobcats led 72-66. The Eagles had three turnovers and missed three shots during the stretch. Montana State (10-12, 7-5 Big Sky) has won three of four. Eastern Washington (8-14, 6-5) had its three-game win streak snapped. • Emese Hof and Beatrice Mompremier had double-doubles for the No. 25 Miami Hurricanes, who applied smothering defense at home to beat the No. 4 Notre Dame women 72-65. • Don Johnson, an All-America guard on two of coach John Wooden’s earliest teams at UCLA, has died. He was 88.